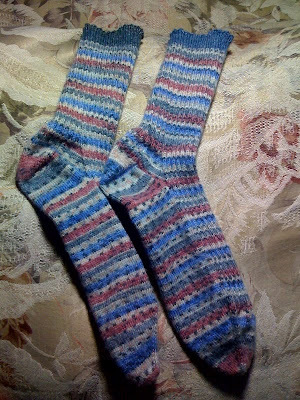 Behold the largest socks I've ever knitted: intended for my nephew who wears size 10 shoes. Yes, the color variation is intentional, even the green vs. blue top edge of the socks. My nephew is an artist, and I think he will appreciate the variety. He came to visit us this summer on his way to his job teaching art camp. We are hoping he will repeat the experience next summer so we can see him again. The boys enjoyed having another audience for their antics, and someone to ride roller coasters with when Mom and Dad got tired. They also showed him the ins and outs of the exhibits at the Monterey Aquarium. Having my own artist-in-residence made wandering the San Francisco Museum of Modern Art and the San Jose Museum of Art a very interesting experience. He knew of all the artists, and had met many of them. He shared impressions of their personalities, and pointed out facets of their work that I would probably have missed on my own. We kept running into people he knew from the art world, which was fun. We explored the Japanese Tea Garden at Golden Gate Park, and traveled to Sausalito, which I had never been to before, despite living here over a decade already! Unfortunately, I had left my purse and wallet home for our day trip into the city, so I had to mooch off my nephew all day. That was a little embarrassing. Luckily, he had cash, or else it would have been a very boring trip indeed. It was interesting having a "boy" in the house who was really an adult. We could loan him the keys to the car, and ask him to pick up milk or run to the post office. Our little guys are just barely emptying the dishwasher for me, with reminders. I can see why my brother and sister-in-law missed having him home with them. I only hope that my two will grow up to be as polite and self-sufficient when they get older. Until then, it was a pleasure to peek into the future a little.